Kartsakhi to Lagodeki - You call that a road? It was a quiet border crossing by the lake. 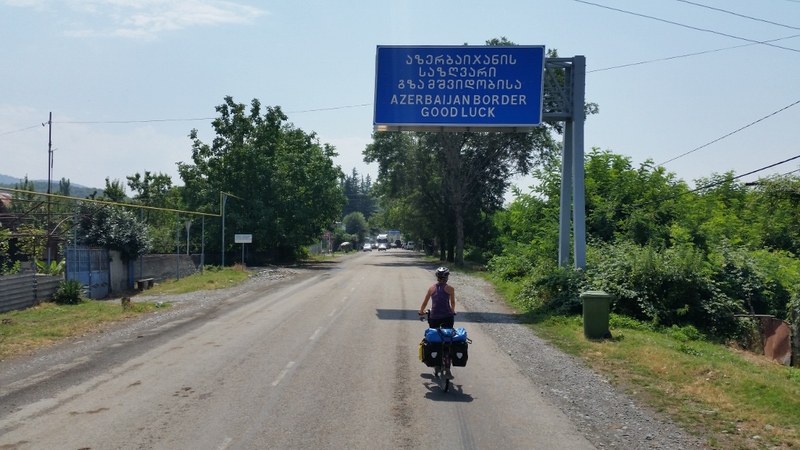 A brief bag check on the Turkish side and no fuss into Georgia! 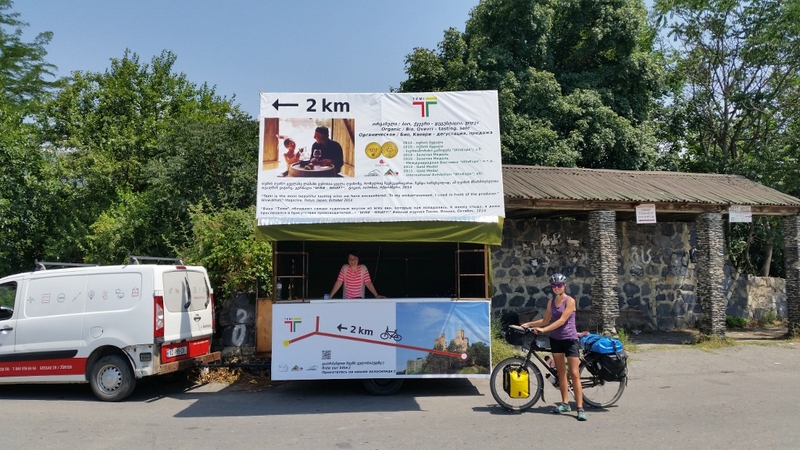 After seeing relatively few tourers in Turkey we suddenly find ourselves at the crossroads and at the top of our first climb meet a German tourer and two French guys touring in a van. Another van stopped to give us cucumbers and tomatoes to add to our lunch, we made quite a crowd! In Akhalkalki we stopped to buy our breakfast staple - oats (much more widely available here than Turkey) and check the sim card prices. It turned out to be 3 lari for the sim card and 5 for 2.5GB of data - thats about £2.50 to keep us going for a few weeks, cheapest country yet. I was watching the bikes whilst Jules was sorting the phones, and eyeing up the ice cream vendor at the end of the street, meaning to go over as soon as Jules came back. Before long though a little boy came over with a cup of ice cream for me, I could have hugged him, I was so hot and sweaty though so I didn’t! When i went over to say thanks they refused payment but told me that to stay healthy I need to have ‘at least one beer & one ice cream a day!’ The vendor was Armenian as is 95% of Akhalkalki apparently. Nice to experience some Armenian culture as we won’t be visiting due to Azerbaijan’s tough entry rules, if you have visited Armenia it can be difficult to pass border control to Azerbaijan. 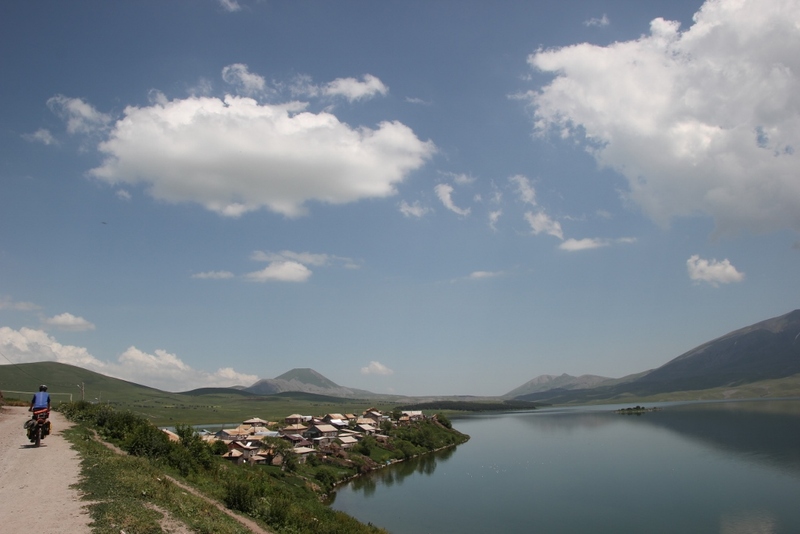 We took the quiet route to Tblisi via Lake Tabatskuri. 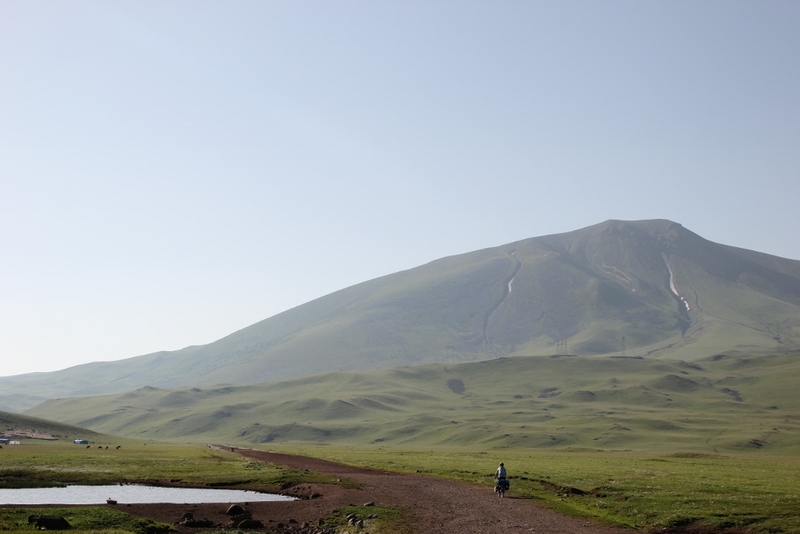 A beautiful place high up on the volcanic plateau, but not an easy place to reach by bike. The road up and down from the lake is coarse gravel, sand, cobbled and steep in sections. 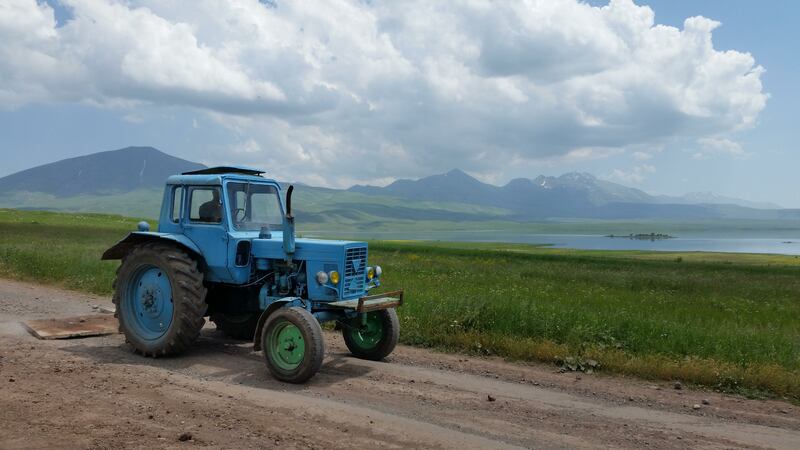 These are the Georgian roads we’d heard of, snaking between villages, where hundreds of people live, battering up their 4x4 ladas to get anywhere. We did a record low of 20km all day, admittedly stopping at 3:30pm for lunch and not moving again! On the way up we met Ian Hallett, a fellow Brit and also riding a Thorn Nomad (same bike as Jules). Great to catch up over khachapuri (Georgian cheesy bread) by the lake and again a few days later in Tblisi. The picnic spot was marked on our map (OSMAnd - this road doesn’t exist on Google!) 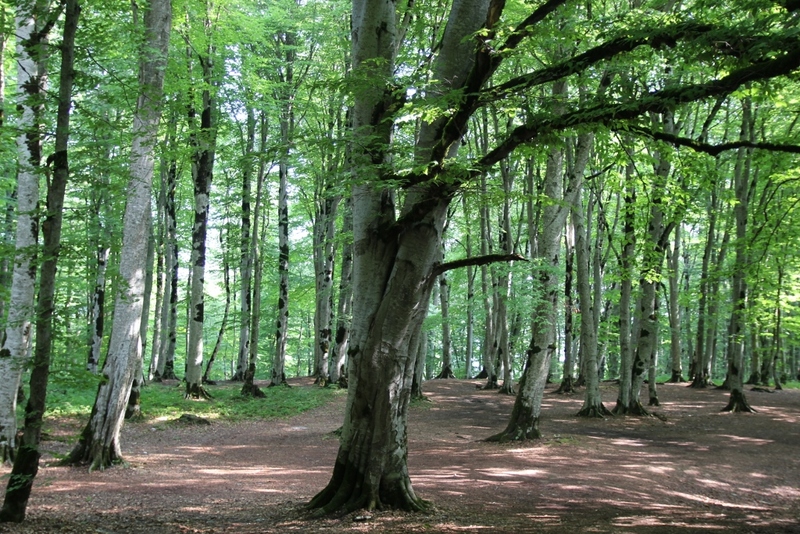 as was a campsite. There were lots of locals picnicking, but definitely no campsite. A park ranger came along and gave us his number in case of any trouble, so all ok, and unless you speak Russian, the locals loose interest quickly and don’t bother you. The only thing to be wary of on your way through the plateau, dotted with nomadic sheep herders, are the Caucasian sheep dogs. With male dogs weighing up to 100kg and evidently turned irate by the sound of a bicycle wheel some 150m away, there is no getting away from these bear-like beasts. You have to stop and shout and threaten with a big stone, until eventually a shepherd comes to your rescue! A few things struck us over the next few days as we rode towards Tblisi: Many of the villages we past through were half empty with abandoned houses; old Soviet trucks, tractors and ladas were the vehicle of choice until you neared the city where large, expensive 4x4s became the norm; Oxfam, the EU and US Aid sponsor a number of farming projects in the region. Much of this is explained by Georgia’s sad recent history. 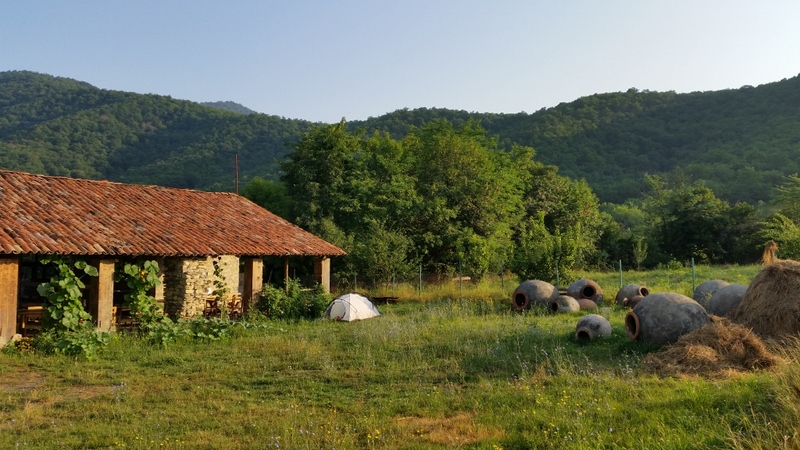 After finally gaining independence in 1992, many farmers lost their supply market to Russia and became broke. Subsistence farming is still a way of life here. Whilst up at 2000m on the volcanic plateau you’d think it’s all downhill to Tblisi, which sits at 400m above sea level. Nope, still 1400m of climbing but the road past Manglisi is beautiful, transitioning from flat grassy farmlands to lush forest, and it’s all downhill from Kojori. Tblisi is a cool capital city. 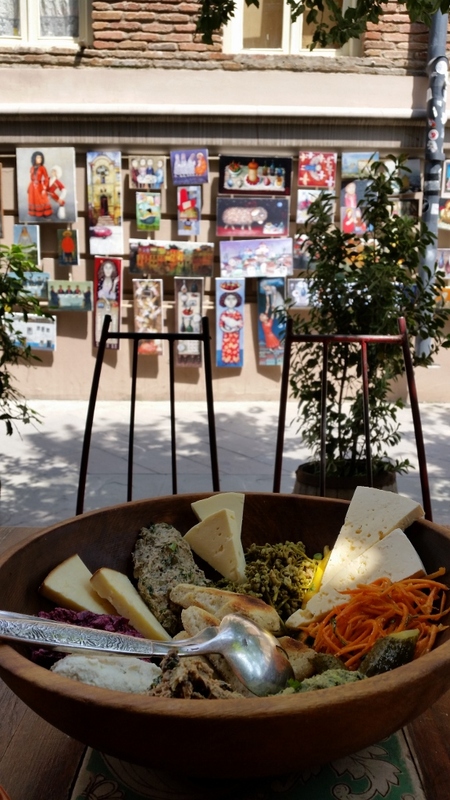 Great food, wine, coffee, arts and culture. 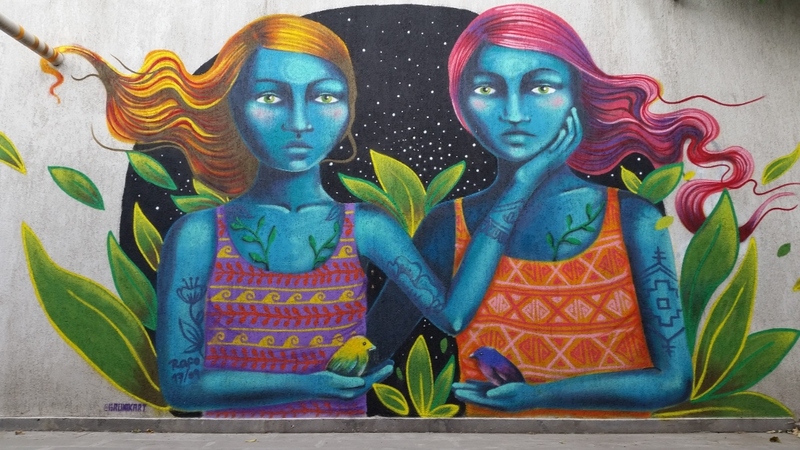 Street art and modern buildings are mish-mashed between old Orthodox churches and Roman-style baths dating back to the 1st century. A huge new Cathedral has been recently completed and finishing touches are still being made inside. It’s certainly not to everyone’s taste and is extremely opulent inside with bejwelled paintings and gold leaf decor, especially considering the falling down houses around it. 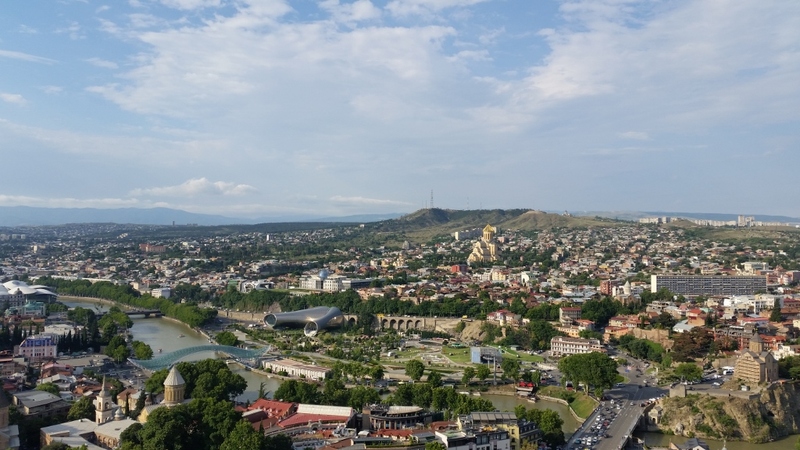 Tblisi is a city of two halves as we found out talking to a local: accessible by metro/bus/car but with awful air pollution; it’s multi-cultural - over 80 nations can come and work in Tblisi for one year - but this is pushing out many locals and the offer is not reciprocal in many cases. On the positive side this meant that lots of places were showing the Football World Cup so we caught up with a few other cyclists to watch England reach the semi-final!!! Sadly that’s as far as we got. Back to cycling. 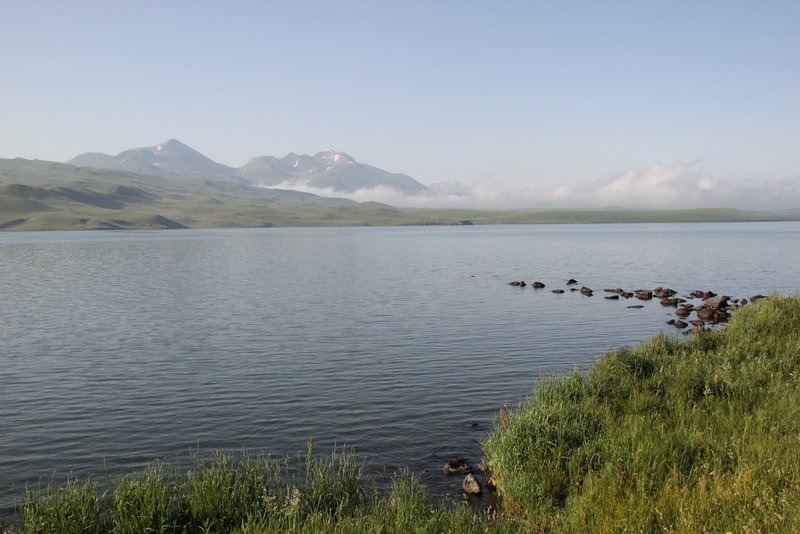 We exited North from Tblisi past Tblisi Reservoir and into the cool of the National Park. 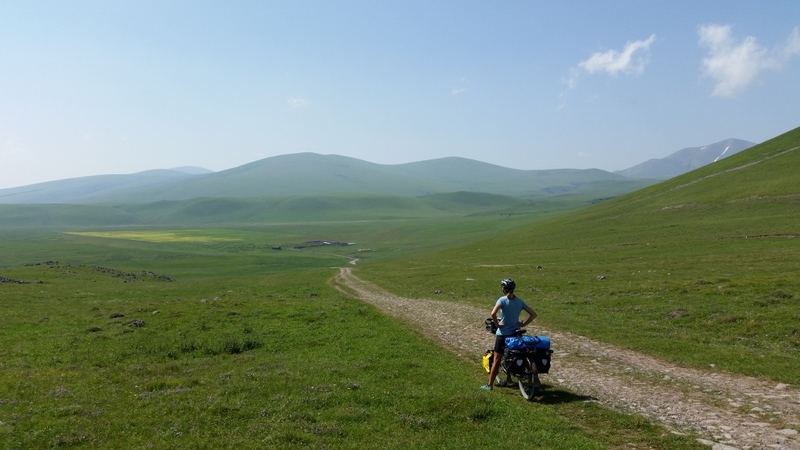 Apart from the 30km section of road between Tianeti and Akhmeta, the roads were good with just gentle undulations. A good thing too as temperatures are now 40+ every day and we are suffering!! 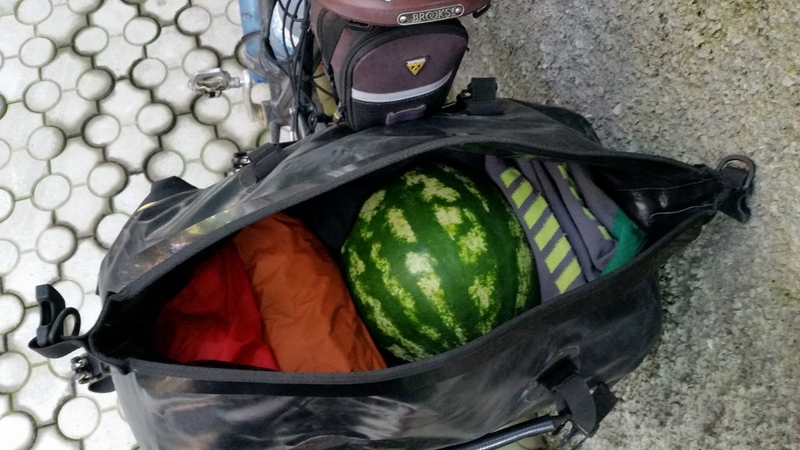 Making the most of the numerous watermelon vendors on the side of the road, always in the shade too. 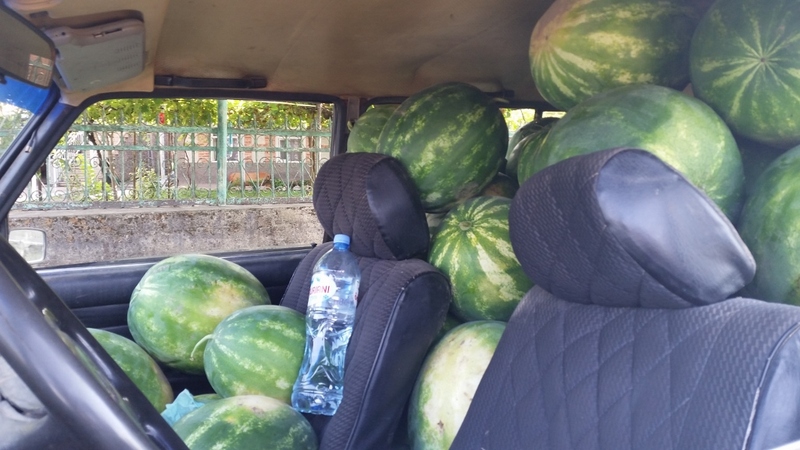 How many watermelons can you fit in one lada…? …or, on that matter, in a rack pack? Cycling through the Kahketi wine region we were keen to taste some Georgian wine, which is cellared underground in 3000 litre clay pots, and has been made this way for thousands of years. On recommendation we went to Temi Community, a community built to support individuals and families with special needs and has a strong focus on sustainable living - food, farming, building and making wine! It was an incredible place to visit and spend the night. We are both in awe of the work that goes into Temi and only wished we had a mini fridge so we could take some wine away with us! Georgia is a country we will defintely return to. 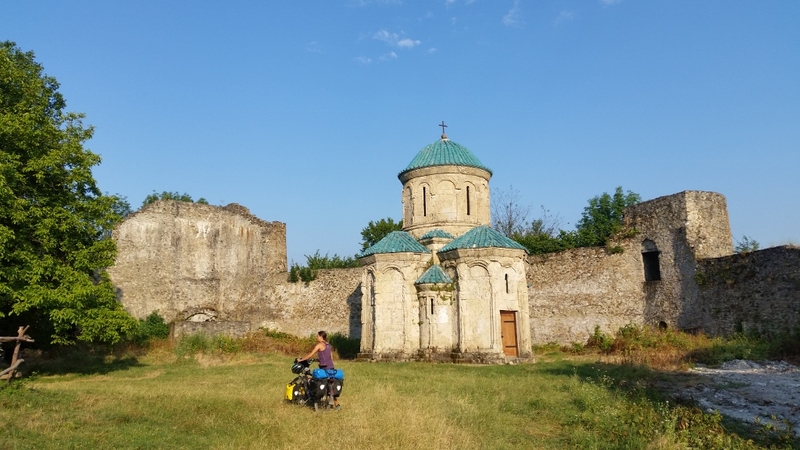 We didn’t have time to head into the Caucasus proper, where the highest peaks are above 5000m, although we got a glimpse riding through the foothills in the last few days. Although I hear they are slowly sealing many of the local roads, perhaps next time we will visit on foot to do some hiking up in the hills. Until next time, madloba. Good luck indeed!!! The driving definitely got worse over the border.